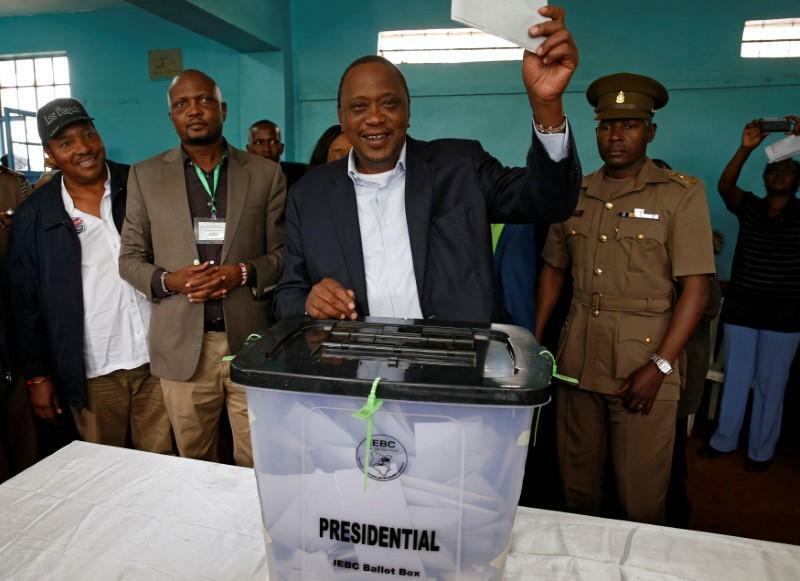 Results of Kenya’s presidential election re-run started to trickle in on Friday, with early estimates of the turnout at below 35 percent, dealing a blow to President Uhuru Kenyatta’s hopes for a decisive second-term mandate. With nearly all followers of opposition leader Raila Odinga heeding the veteran’s call for a boycott, Kenyatta’s victory is not in question. Less clear is his ability to unite the east African nation, whose deep ethnic divisions have been exposed during a bloody and chaotic election process stretched over the last three months and multiple court cases. The first election, in August, was annulled by the courts because of procedural irregularities, denying Kenyatta a simple victory over his long-term political rival. If the expected legal challenges fail to clear a path out of the crisis, including a possible order for another re-run, the stage is set for a protracted and economically damaging political stalemate between the Kenyatta and Odinga camps. “Unless the courts annul the election, Kenyatta will move forward without a clear mandate and Odinga will pursue a protest strategy whose chances of success in the circumstances are not very high,” International Crisis Group analyst Murithi Mutiga said. Voting on Thursday passed off without a hitch in pro-Kenyatta areas but was marred by skirmishes between police and stone-throwing opposition supporters in four pro-Odinga counties where polling stations were from prevented from opening. The division was neatly captured in local media, with the Standard, a leading tabloid, headlining its front page: “One Kenya, two faces”. The outcome is being closely watched across East Africa, which relies on Kenya as a trade and logistics hub, and in the West, which considers Nairobi a bulwark against Islamist militancy in Somalia and conflict in South Sudan and Burundi. Election officials postponed voting in the trouble-spots – all staunchly pro-Odinga districts – for 48 hours although there is little prospects of the delay making any difference given the strict local adherence to the calls for a boycott. In all, four people were shot dead by police – three in the pro-Odinga western city of Kisumu, governor Anyang Nyong‘o said, and one in the neighbouring county of Homa Bay, according to police. The election commission said more than one in 10 polling stations failed to open due to “security challenges”. Its chairman, Wafula Chebukati, Tweeted overnight that 6.55 million ballots had been cast – just 34.5 percent of registered voters. By contrast, turnout in the August election was 80 percent. On Friday morning, shops started to re-open and traffic returned to Kisumu and the restive Nairobi slums of Kibera and Mathare, although the roads were littered with rocks and the remnants of burnt barricades. Around 50 people have been killed, mostly by security forces, since the original Aug. 8 vote, raising fears of sustained violence only a decade after 1,200 people were killed in serious ethnic fighting triggered by another disputed vote. Posted by Above Whispers on October 27, 2017.